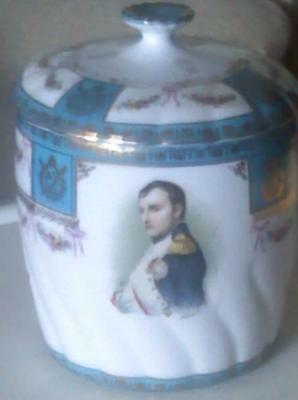 N with Crown Above Pottery Mark Query on Biscuit Barrel Jar with Napoleon Portrait:- I purchased this porcelain Napoleon biscuit jar at a reputable antiques store in New Jersey. I've had a hard time identifying the mark and approximate age. It has a crowned N on the bottom - the mark is repeated in gold on the lid 3 times. Someone suggested Capodimonte, but I've had difficulty finding a matching mark. Many thanks for submitting this interesting jar/barrel, most full of its own importance, I must say - just like the little Emperor himself! So full of its own hype is this biscuit barrel. Not once, not twice, but 3 times the mark is stamped on its lid!! ...and then once again for good luck on the base, just in case we missed it. Well, well well, never have I seen such self-aggrandisement! The silly/ironic thing is, the mark on this item - the N with a crown - is possibly the most meaningless of all marks. Originally the mark of Naples placed on the most fabulous of Italian wares. pre-dated the Napoles factory stemming from 1713. They continued using the N pottery mark making reproductions of the older 'Capo di Monte' wares with the purchased moulds and equipment. The term Capodimonte or Capo di Monte or Capodemonte or Capo de Monte ceased to mean anything, apart from a vague homage to the original factory when, at the end of the Napoleonic wars several competing factories began making wares and calling it 'Capodimonte'. It would be like having several competing makers all calling themselves "Staffordshire Wares". After that, the N above crown was copied again and again and again throughout history. Many German factories, particularly Thuringian, started to use the N mark. French makers like Sevres have also used the N & crown. So, I understand why your research has been difficult. My valuation experts have an uncanny knack of being able to tell, not only the value, but also the age, region and history of the style. They know all this even thought the actual maker may be impossible to trace. 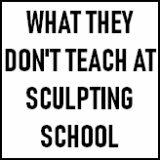 I suppose this is why they are experts. It wouldn't surprise me if the experts came back and said this was a later French made piece around the turn of the Century (c.1900) made in the style of a Sevres item. 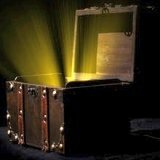 However, I am no expert, this is pure speculation and a little knowledge is a dangerous thing, so please don't trust what I say. I have a cup and saucer with the exact same mark in gold, appears on bottom of both cup and saucer. There is a hand painted painting of Napoleon at the battle of Ratisbonne, based on an original painting by Pierre Gautherot. I have searched for the source of the mark without success. Capodimonte was suggested, but I do not feel that the mark resembles any that I have found attributed to Capodimonte. I believe it to be french porcelain, possibly Sevres, but if it were Sevres, why wouldn't it have the Sevres mark? I have a plate with the same mark. 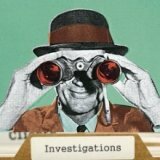 Has anyone found out any info on this mark since this post started? I have seen posts on other sites that seem to feel this is a valid mark from Sevres in France and that the items are worth $500 and upward. But I prefer to know for sure what they are before posting a price on the value of the plate. This plate has handles like a serving plate. I have both a Napoleon plate and matching Josephine Plate in the same style except a small 35 is stamped into the back of the plate as well as the markings indicated above. I ws looking for vaule? My husband's mother immigrated from Russia, when she was a young girl, and brought with her a Tea Set, with the Gold Crown and N. She was born June, 1910, and became a US Citizen in 1932. So way back then the Gold N and Crown adorned items. The Tea Set is truly a lovely piece. I do hope you too, enjoy yours. Many thanks for all your various contributions above. 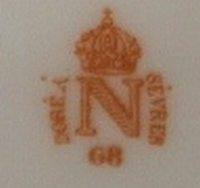 I have been doing some further research on this French Sevres style of N with crown mark and apparently, a red ink stamped version on this mark was a standard mark commonly used by Sevres NOT during the time of Napoleon 1 (1804 - 1815) but during the reign his nephew Napoleon 111 (1852 - 70). This Sevres pottery mark post the revolution and post Napoleon Bonaparte is referred to by Ruthgeerts as the "Imperial Period" mark (see photo below) and according to my Miller's Guide to Pottery and Porcelain Marks it is the mark of the 'Second Empire' (referring to Napoleon 111's lengthy reign as dictator in France). According to Miller, the mark underneath refers to a dating code, but they don't expand further. So having researched into this mark a bit further, I am tempted to speculate that the variation shown in the photos above on Sherri's biscuit barrel is a later version, possibly by the Sevres factory, but also possibly just by another maker in the style of the Sevres red mark, and, like I said in my original reply, possibly late 19th, early 20th century. It would be great to get a knowledgeable collector to help out further with this one, so keep posting any information you have. Juliette picture on biscut jar. My biscut jar is just like Napoleons. but has a picture of Juliette on it. It has the N & crown plus an S on it. Nothing on the lid. 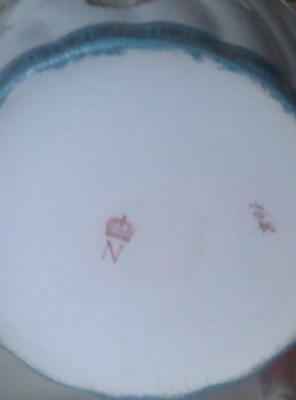 within this circle is a Crown above a N.
My research shows that this is a mug from 1956 from the Lord Nelson Pottery Company, located in Staffordshire, and now run by the Cotton family. So this obviously is not referring to anything Napoleonic. The crown and N are common on alot of different types of pottery? Yes, there are many makers using the crown N mark. This N mark is specifically French (Sevres) as in the report below. The original mark which others have copied from is the mark of the Royal Naples factory of Italy which was an early adopter of very high quality standards in porcelain art. Their factory was destabilized and ultimately sadly destroyed in the Napoleonic wars of the late 1700's. The style was carried on by another Italian factory who used their artwork and N mark. The style or the old factory became known as Capodimonte and after Ginori, there were a host of imitators in Italy, France and Germany. Many Thuringian quality makers from Germany used the N crown mark for their export wares in the late C19th. In the early part of the 20th century the Italians seemed to invent an almost comic caricature style of modelling which coined the generic title of Capodimonte and had the Ginori style of N mark, but as far as I can see, bears no relation to the wares of the original Naples factory. So someone would have to explain to me how this term began to be coined for the C20th caricature figurines bearing the N mark. Based on my research, I would suggest the N crown mark is supposed to represent Napoleon's royal mark and nothing to do with the manufacturer. That may well be, as it is not a standard Sevres mark, but Sevres did use that mark (see my previous comment, below) and I haven't yet come across any other maker using the same one. The orange/red mark peter posted is " Dore A Sevres " . it Also comes as " Decore A Sevres " . I have a decore A Sevres . Just my research , I am no expert. I have a miniature teaset, golds and cobalt blue with a gold Crown' over a gold N with sevres decor sideways facing, on the side of the N. It is a modern and new set, and it was made by Noritake in Japan. They are still available now. I know this mark and it is neither Sevre or Capo Di Monte. The objects with the Crown and N are nearly always scenes form the life of Napoleon. The Crown and N can be in Gold/ Black or Red. Just now and again there is an additional mark of "W" (in a garland) "Wien" (Vienna) and the word Austria. I attach a link to illustrate an example. As to the factory I have no idea who they are. Your anonymous contributor above who said `Noritake Japan, 1950s` is closest as there are many, many pieces with this transfer printed portrait of Napoleon that originated in the Far East. The crude gilt, poor painting and `bleeding` of the blue are all typical of the genre .... as is the fact that the porcelain body is decidedly different from Sevres hard paste. Similarly decorated items made from pottery are also known. Items bearing transfer printed copies of this well-known portrait were also produced in Bohemia ( now the Czech Republic ) and Bavaria, German from late in the 19th century but much more commonly in the 20th century. The Sevres crowned `N` with date mark was not extensively used during the reign of Napoleon III ( 1852-70 ) ..... and neither was the other Second Empire mark of the imperial eagle with date. The most commonly used mark of the era was the green printed oval with `S.` plus two digit date. The Second Empire was replaced with the Third Republic when Napoleon III was deposed in 1870 and neither of the two marks specific to the era were used after this date. 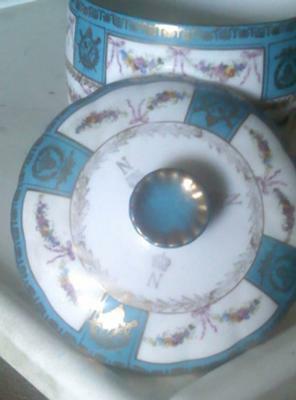 I have a porcelain desk set with an red/orange mark of Dore A Sevres and crown above the initial N.